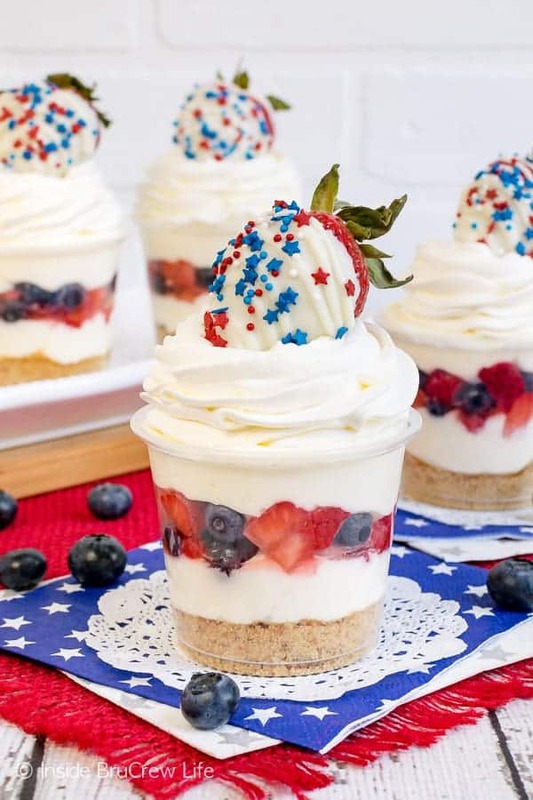 These easy No Bake White Chocolate Cheesecake Parfaits have layers of cookies and fruit making them the perfect dessert to share at summer parties and picnics. 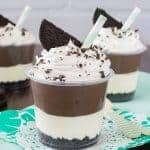 Make sure to add a batch of these No Bake Triple Chocolate Cheesecake Parfaits for the chocolate lovers’s in the group too. I am so excited to have my chief recipe taste tester home for the summer. Our oldest got back from his first year of college a few weeks ago, and I put him to work right away trying out some recipe creations. Not that he minded at all. After a year of eating fast food/college food, he has been devouring all the home cooked food and Orange Cream Cheesecake he can. 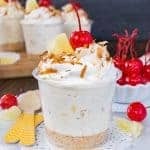 I’m all for baking cheesecake whenever I can, but this past year I have really gotten into making no bake cheesecake mousse. 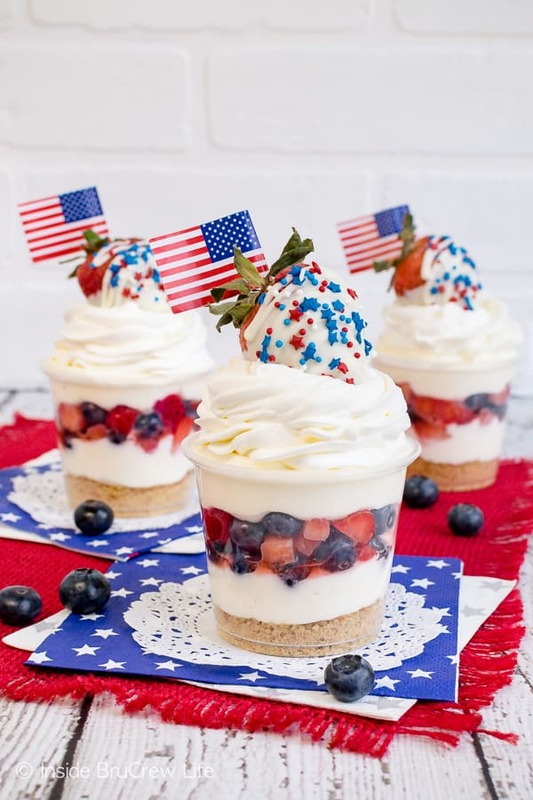 Bypassing the oven in favor of spending 15 minutes in the kitchen layering cheesecake in little cups with cookies and/or fruit is so much easier. So far we have tried strawberry, mocha, peanut butter, and pina colada, so a white chocolate version was bound to happen sooner or later. 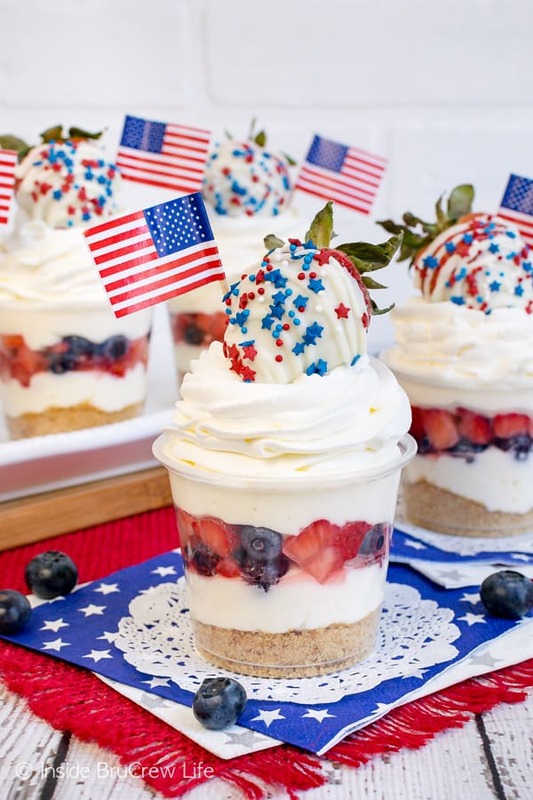 My taste tester gave these No Bake White Chocolate Cheesecake Parfaits an enthusiastic two thumbs up! 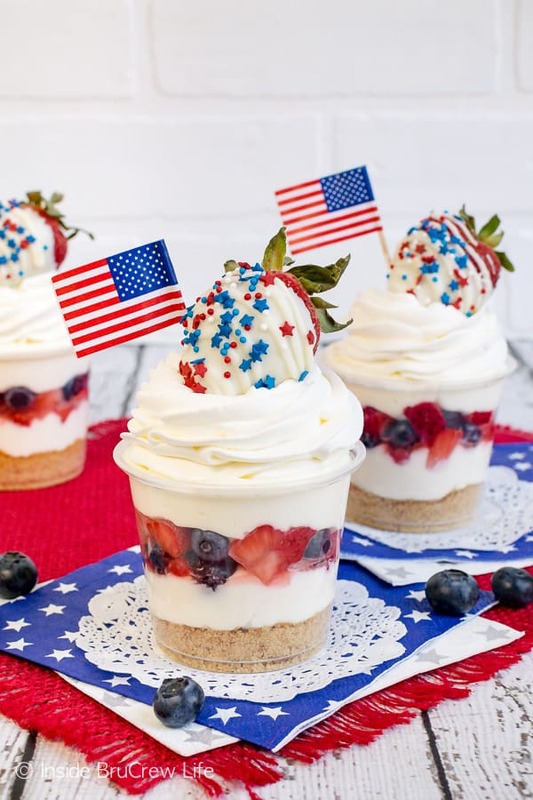 With summer and holiday weekends coming up quickly, I wanted to layer no bake cheesecake in a cup with strawberries and blueberries. In my head I knew the red, white, and blue layers would be so pretty. I love it when I’m right! 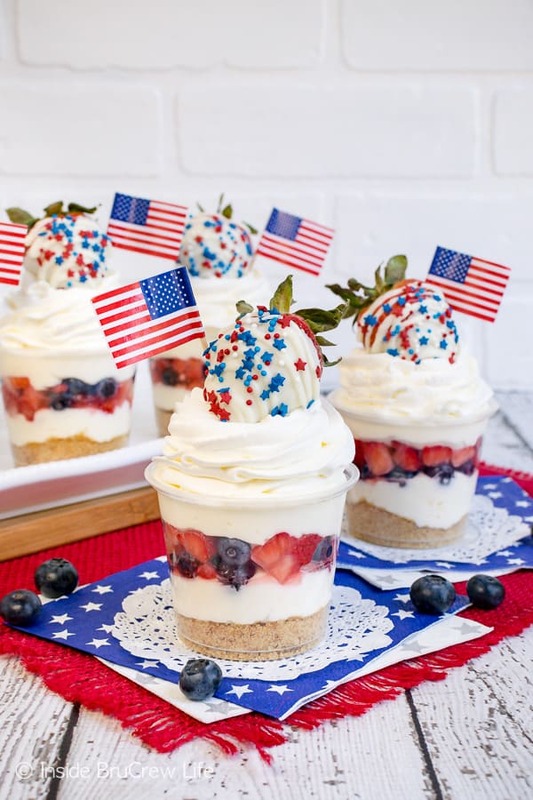 Chocolate covered strawberries with holiday sprinkles and a cute little paper flag pick added the perfect extra touch to the top of the parfaits. Both are optional, but why would you want to skip the pretty toppers, right? 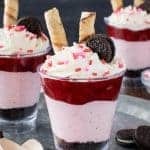 The chocolate covered strawberries are easy to make and add such a fun festive look to these No Bake White Chocolate Cheesecake Parfaits. Make sure you buy crunchy oatmeal cookies for this simple dessert. 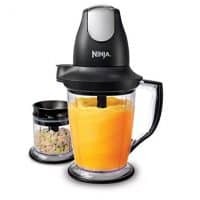 If you have a homemade recipe, feel free to use that in place, but when I’m doing quick and easy desserts, I go for the store bought cookies every time. Crush the cookies and divide them into the bottom of seven 5 ounce cups or glasses. 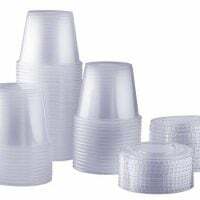 You can find small condiment cups in the paper goods aisle at Walmart. 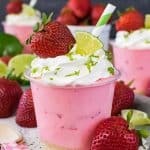 They come with a lid too, so you can pack the cheesecake cups in a cooler or basket and add the toppings later, if you want. Set out the cream cheese at least 30 minutes before you need to start the recipe. Beat the cream cheese, sugar, and extract until it is creamy. Set this mixture aside for just a bit. Melt the white chocolate in the microwave according to the package directions. Dip seven whole strawberries into the chocolate and set on a wax paper lined tray. 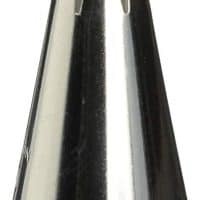 Place one tablespoon of the melted chocolate into a plastic Ziplock baggie and cut one tip off. Drizzle the chocolate over the dipped strawberries and add red, white, and blue star sprinkles. Add the rest of the melted chocolate to your cream cheese mixture and beat again. Fold in some Cool Whip. 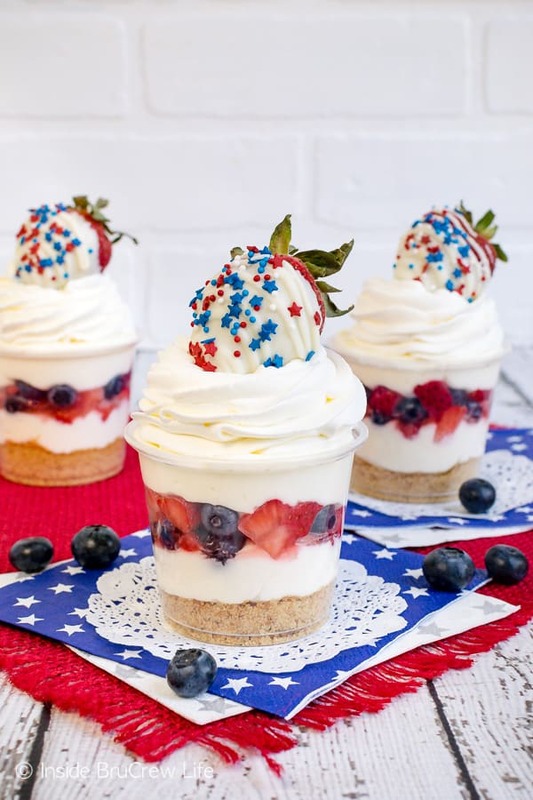 Layer the cheesecake and fruit in the parfait cups. Add a swirl of Cool Whip with a piping bag and icing tip 1M. 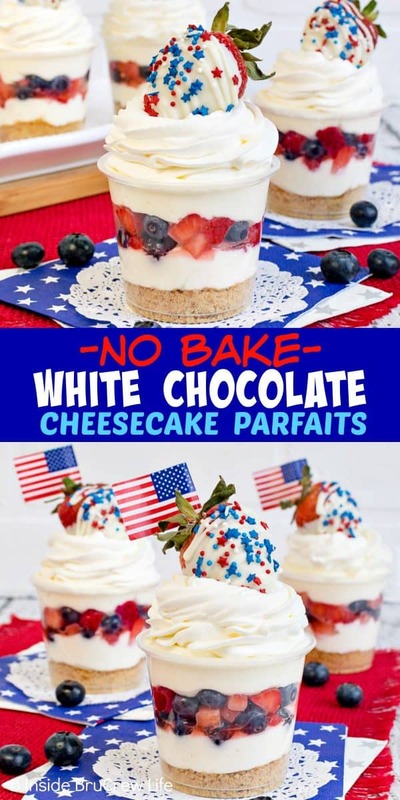 Add the chocolate covered strawberry and flag right before serving. 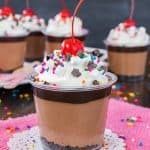 These Chocolate Strawberry Parfaits have layers of candy bars, sweet mousse, and fruit. Love it! Grab all the fruit and graham crackers and go to town on this Lemon Cream Fruit Dip! It’s so fluffy! The sweet and salty layers in this Berry Pretzel Dessert is right up my alley! 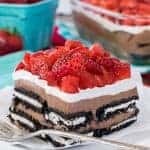 Chocolate covered strawberries would make these No Bake Chocolate Cream Tarts a fun holiday dessert! Crush the oatmeal cookies and place in the bottom of 7 - 5 ounce containers or cups. Beat the cream cheese, powdered sugar, and vanilla until creamy. Set aside. Melt the white chocolate melts according to the package directions. Dip the whole strawberries in the melted chocolate and place on a wax paper lined tray. Place a Tablespoon of melted chocolate in a small plastic Ziplock baggie. Cut one tip off and drizzle over the strawberries. Top with sprinkles. Let set. Pour the remaining white chocolate into the cream cheese mixture and beat again. Fold in 1 1/2 cups Cool Whip gently. Spoon the mixture into a large piping bag. Pipe a swirl of cheesecake into the bottom of the prepared cups. Mix together the strawberries and blueberries and place a large spoonful on top of the cheesecake. Pipe the remaining cheesecake on top of the berries. 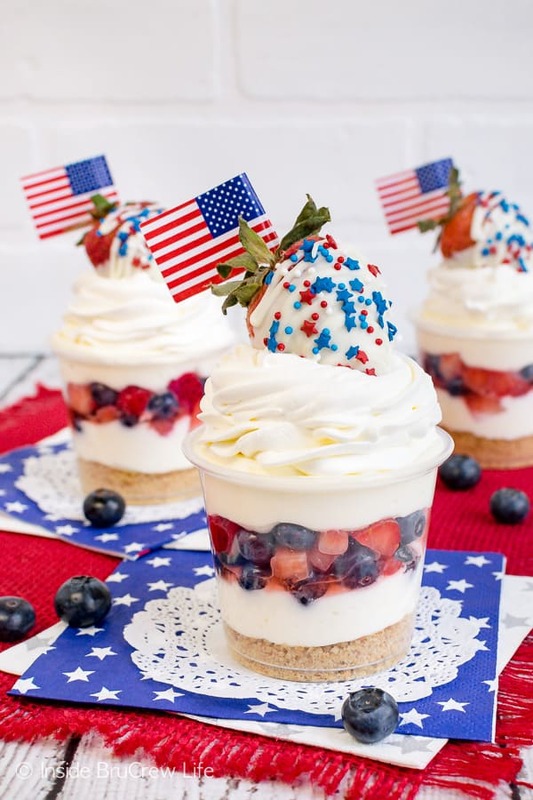 Use a piping bag and icing tip 1M to swirl the remaining Cool Whip on top of the cheesecake layer. Top with a chocolate covered strawberry and paper flag right before serving.